I am really excited to introduce you to an artist that I have admired for many years now. It has been a joy to watch this artist find and grow her talent. I had an opportunity to interview her, and so in this post I will share not only her beautiful art, but her thoughts on the creative process. 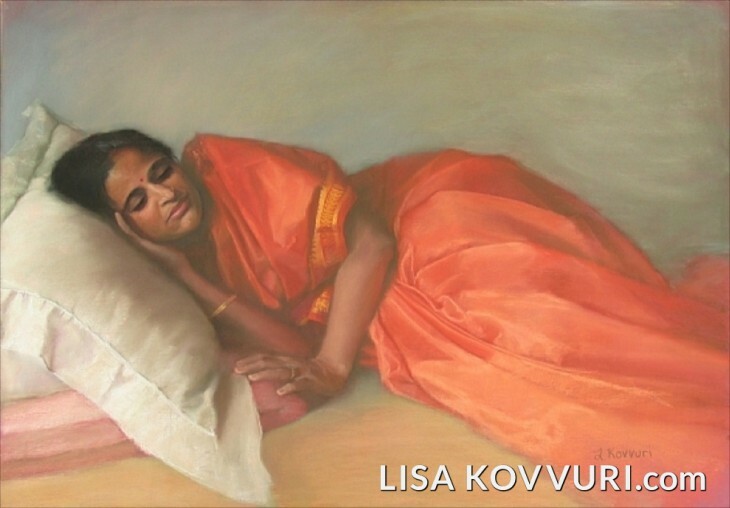 Lisa’s paintings have been exhibited in juried exhibitions across the United States, including such prominent venues are The Hecksher Museum of Art, Huntington, NY, The Salmagundi Club, NY, NY, The Bosque Conservatory, Clifton, TX, The Crocker Art Museum, Sacramento, CA, and The Academy of Art Gallery, San Francisco, CA. 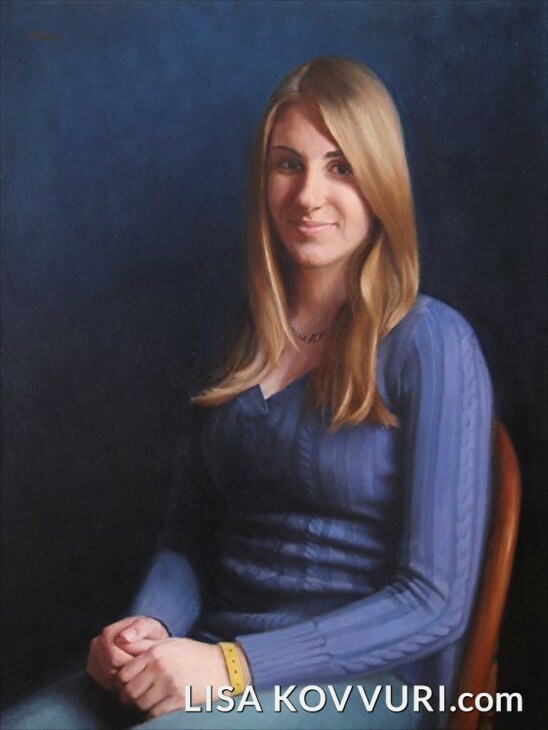 She has a still life chosen as a finalist in The Artist’s Magazine annual art competition, and her portrait work has received recognition from The Portrait Society of America. Born in California and raised on Cape Cod, she now lives in New Hampshire with her husband and two sons. A long post, so grab a cup of coffee or tea, sit back and hopefully enjoy the read and beautiful art. –Lisa Kovvuri, Excerpt from interview with art critic Brian Sherwin for The Art Edge. When did you discover you had artistic talent as a painter? When I was young I found an old art supply box that belonged to my father. In it, along with various pencils, paints and charcoal boxes were books on how to draw trees, how to draw boats, and how to paint with a palette knife. There were also drawings he had done. I was fascinated. I made my own attempts at drawings from the books and copying my dad’s drawings. He eventually gave me the box. I’d say I’m most influenced by the painters of the Boston School. Edmund Tarbell is my favorite of them. 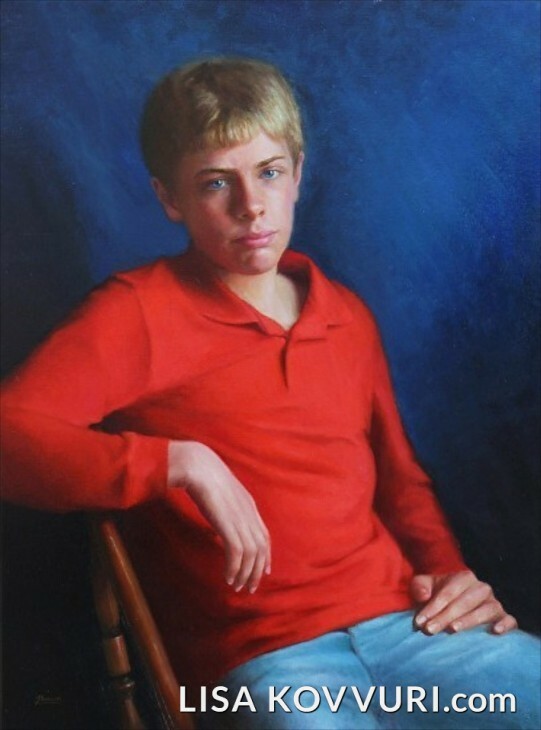 The reason is the combination of really good, academic drawing skills and natural color. They emphasized exploring color the way it is in nature, the way the impressionists did, which makes the effect of light remarkably beautiful in the paintings. They have a power, because of that focus, and a poetic sense of design that I don’t find in many other paintings. Having said that, my understanding of how to see and use color is attributed to Nelson Shanks. 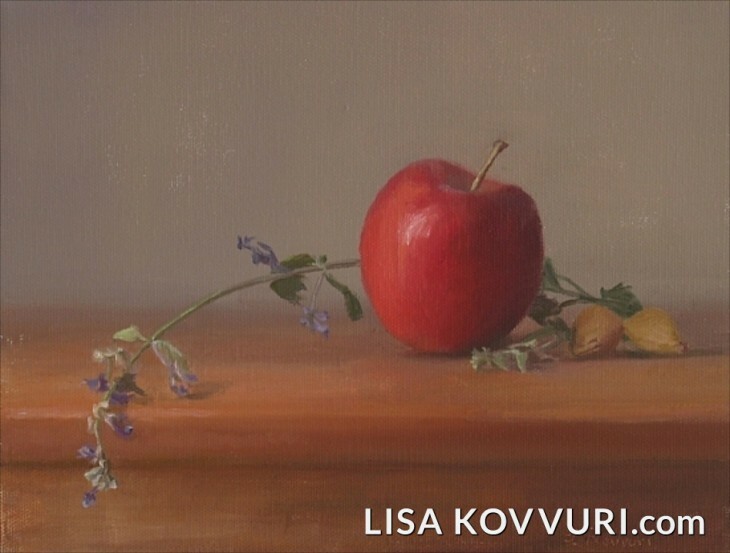 The intensive painting course I took at his school, Studio Incamminati, gave me the tools to get what I want out of color and really understand it in the context of how it works in nature and in light. I love to look at Jean Leon Gerome, Tarbell, John Singer Sargent, Anders Zorn, and Ilya Repin. I also love Hovsep Pushman’s still life paintings. What state of mind is your most creative? Most stifling? My most creative state is usually when I can be alone and absorbed in my thoughts. I cherish that time and arrange my schedule to allow for plenty of it. What I struggle with is distraction. My studio is in my home so beyond closing the door, there’s no real separation from work, household tasks, and being a mom. I’m always working on strategies and habits to keep things compartmentalized so my painting time stays focused and productive. 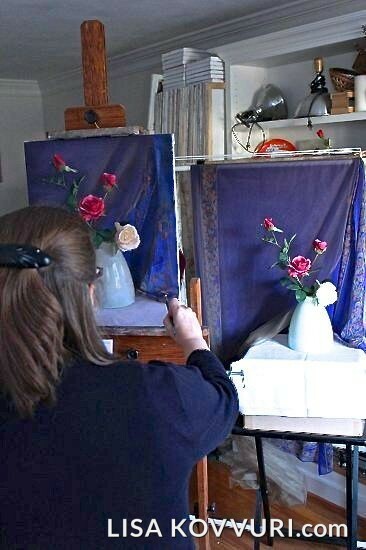 Lisa at work in her studio. Do you have an all time favorite painting that you painted? That hasn’t been painted yet. As a painter I’m always seeking the ultimate expression, an elusive masterpiece. I heard someone say recently, unfortunately I can’t remember who it was, that it was like driving in the dark. You know your destination and where you’re going, but you can only see as far as the headlights are shining along the way. It’s an incremental process that builds on itself a little at a time with each painting. So at any given time I’d say that what I’m currently working on is the most exciting. Do you have a favorite painting not your own that you own? I have a painting by Michael Kline that I love. 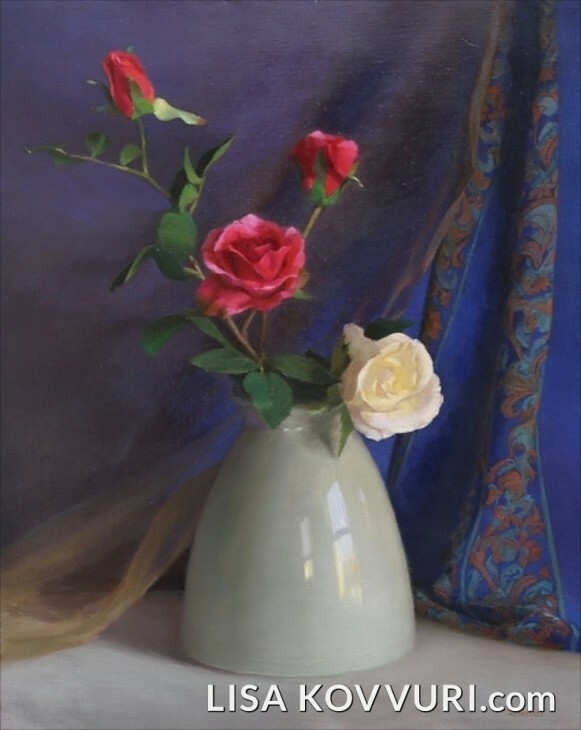 It’s a simple painting of some roses in a square glass vase. It was a recent purchase, and one I had to work to make payments on, but it was worth it. I love the way he paints. He has a very sensitive touch and his subjects are poetic and subtle. I wanted to have one of his pieces in my working environment. 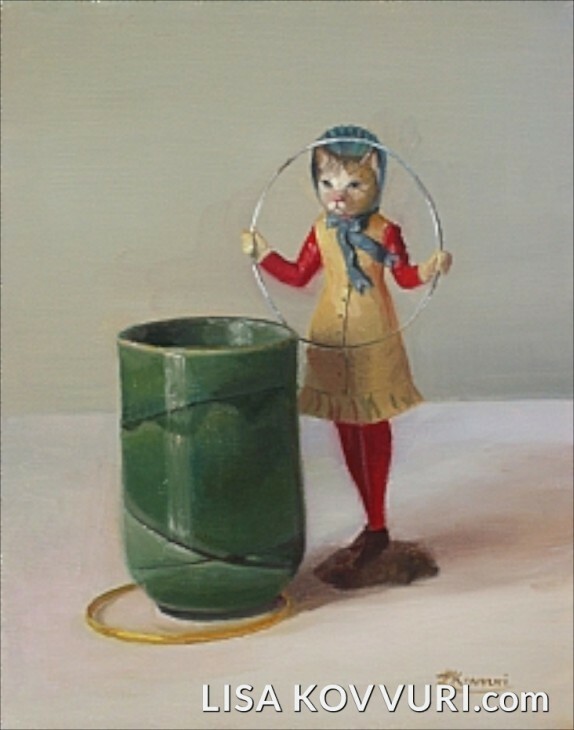 What is your favorite painting by another artist long gone? It’s really hard to pick one favorite. I have several. In my studio I have a small reproduction of “Pygmalion and Galatea” by Jean Leon Gerome. It shows the sculptor in his studio embracing the sculpture of a woman he’s working on and she has begun to come alive. When I first saw it I wasn’t familiar with the story of Pygmalion. Instead, the image spoke to me about the artist’s relationship with his creation. It brought to life the passion and devotion artists feel toward their work, and how wonderfully absorbing it can be. It really is magical watching something come to life before you on the canvas. Now I know the story that it illustrates, but I still see my original version. That painting always makes me smile. What is your favorite painting by a contemporary artist? There are several I love to look at. “Skylar in Blue” and “Skylar Black Coat” are two by Jeremy Lipking of his daughter that I really love. I also like the series of women shopping and antiquing that Joseph Todorovich has painted. My favorites are “Antiques” and “Choices”. 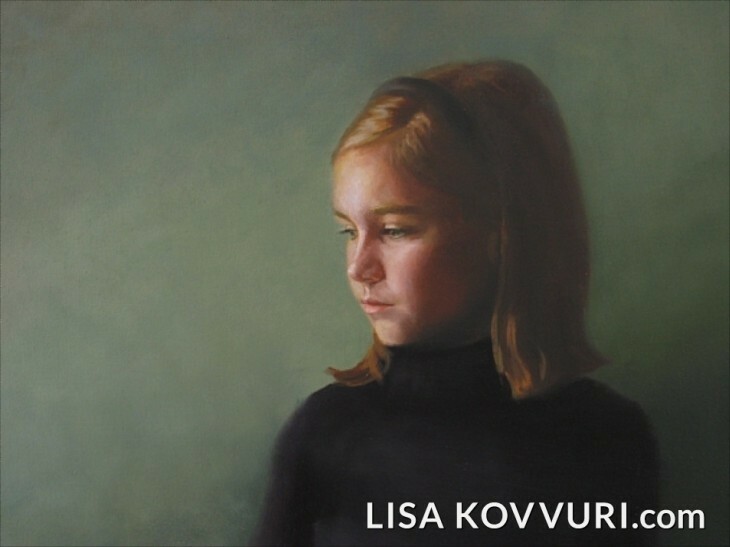 All of these works are unusual takes on figure and portrait painting, and the ideas behind them have a lot to do with why I’m drawn to them. 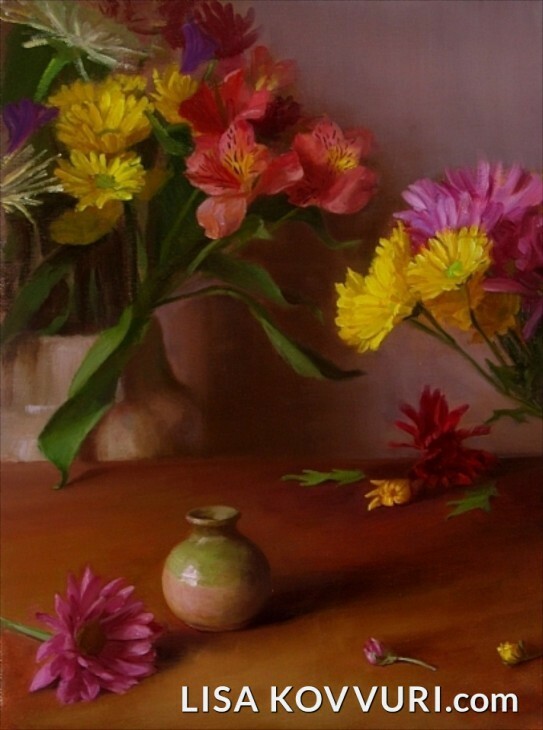 In many of your paintings you use gorgeous saturated colors. Anything in particular that informs that choice? Is there a predominant color/& or theme that you think runs through your work? My color choices come from the things I paint. 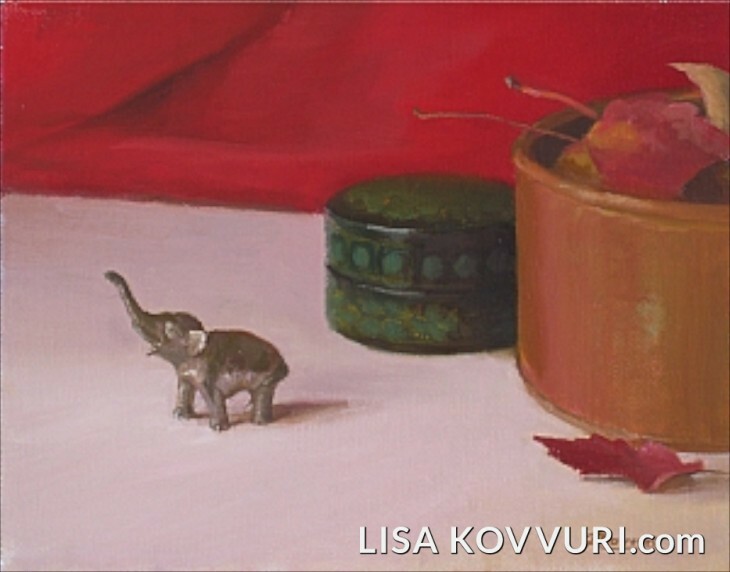 I think the most intense colors are found in my still life paintings, and that’s because of the objects and fabrics etc. that are in each set up. I have a collection of fabric pieces, including saris and shawls from India that are richly colored and I love to work with them. On another level, I think the rich, saturated colors I tend to gravitate toward help me to create the kind of impact I want my paintings to have. 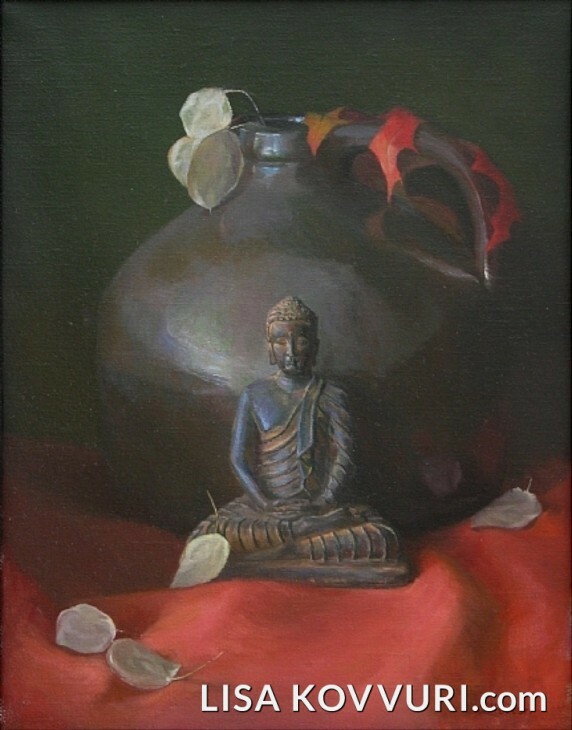 The paintings present a given moment in time and focus on the timelessness within it. The colors give it intensity and power to hold attention, sort of magnify the world for us so we want to linger in that moment. 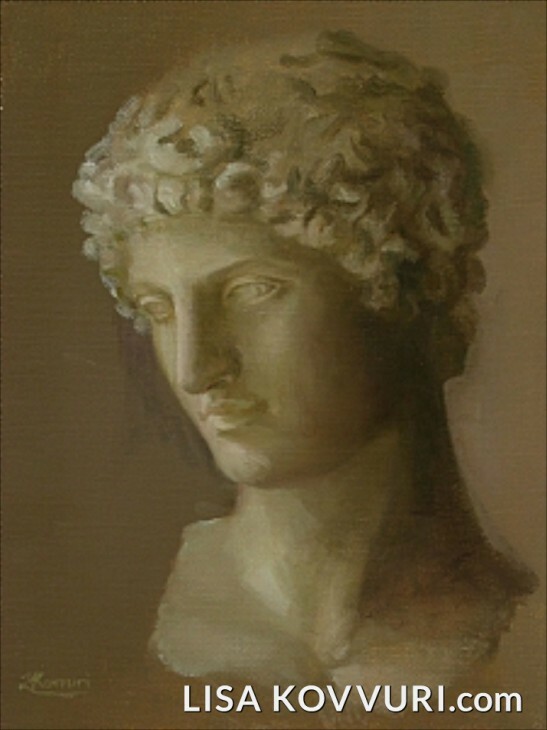 What is your favorite painting medium, and why? Oil paint, hands down. It’s free and flexible and the quality of realistic illusion it’s capable of producing is unmatched. What is your favorite to paint…. still life, portrait, landscape? 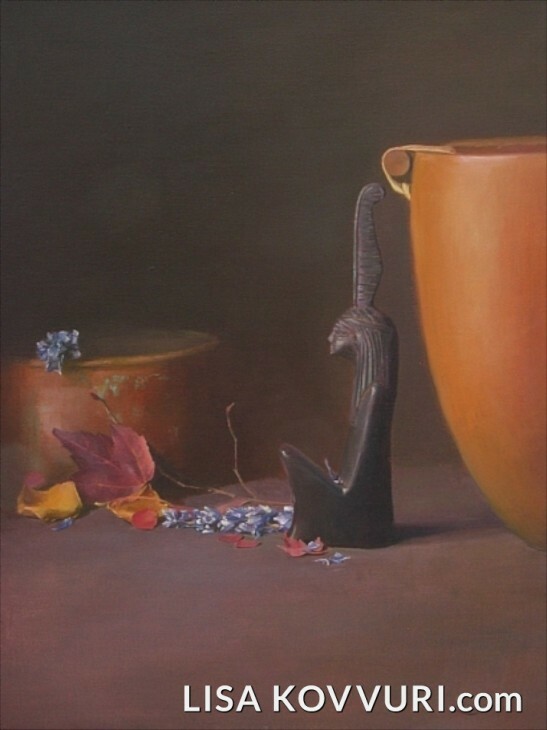 Still life and portraits are equal favorites. I love them both. I haven’t done much landscape painting. I like the psychological component of working with portraits, and the associations we bring to the objects in a still life give them a human essence as well, even in the absence of an actual person. 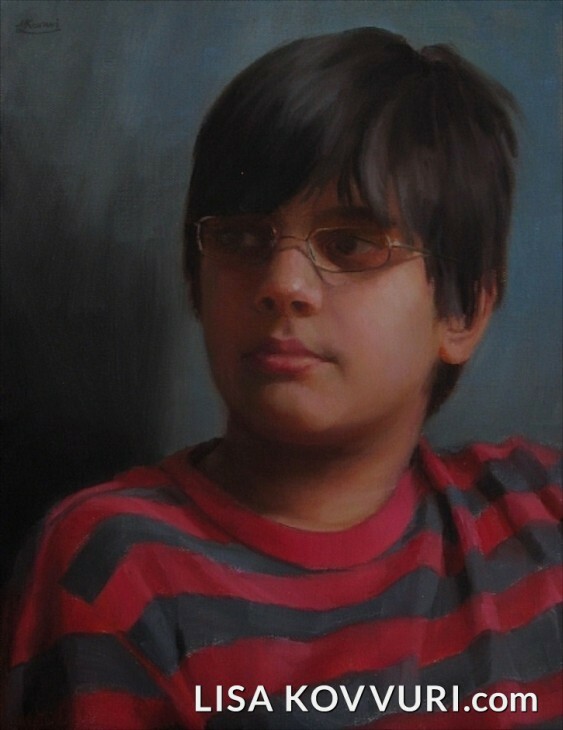 You have an amazing ability to capture expression, even when painting from photographs……how do you do that? Thank you! That’s a little tricky to explain. At the very basic level I have to be sure that it’s accurate and looks like the person. That comes from careful drawing. Expression is less definable. I have to know before I start the kind of look it should have. I decide on the mood and feeling I want and keep that in my mind as I paint. I keep working until I start to recognize what I imagined. It helps if I don’t try to think too much. Logic can get in the way. I have much better results if I trust my instincts and don’t question them. 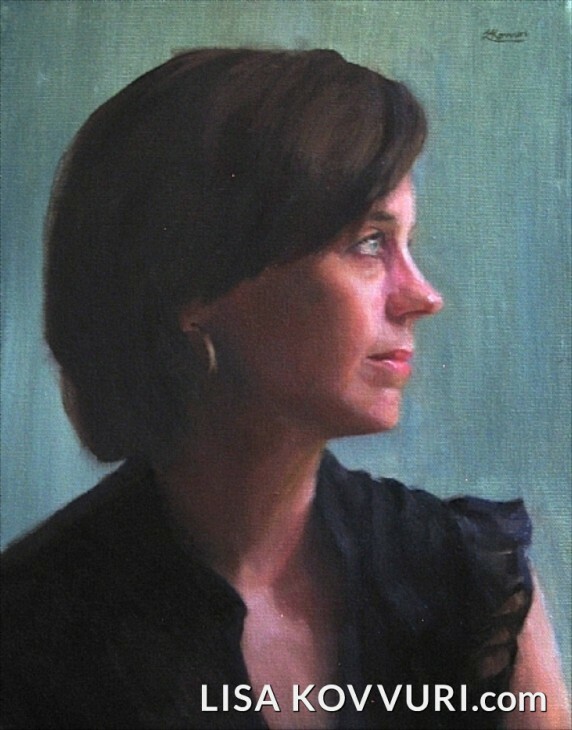 I practice painting from live models on a regular basis also. Studying their faces for hours at a time while painting gives me an intuitive sense of what should be there. I fall back on that knowledge when working from photographs. 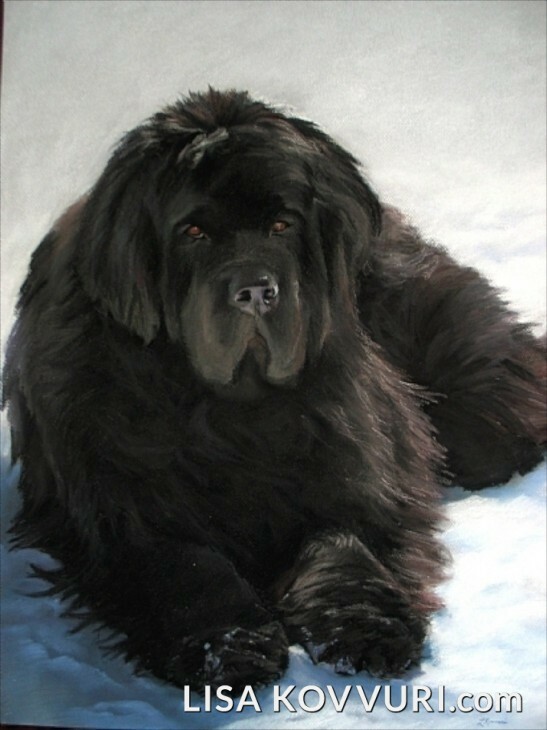 Your Newfoundland paintings are so beautiful….you capture the dogs expression and personality. Are they your favorite animal to paint? Have you ever done wildlife? Thank you. Yes, they are my favorite animal to paint. I didn’t really set out to paint animals – it wasn’t in the plan. 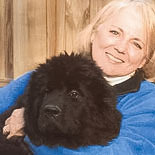 But being the daughter of a breeder, Newfoundlands have always been a part of my family life. I frequently had opportunities to paint them over the years, and I was always glad to do it. Now it just doesn’t seem right not to paint them. They’ve been such a huge part of my life. 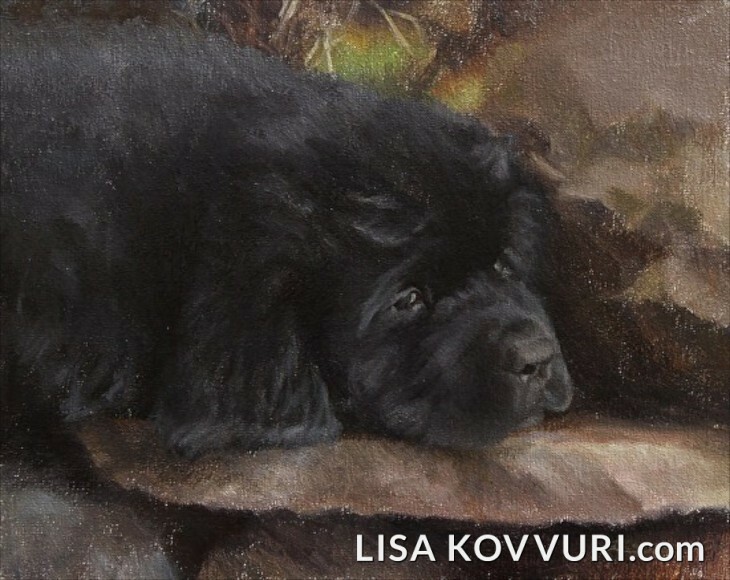 I enjoy honoring them through paintings that say as much about the experience of being with them, raising, owning and loving them as they do about the dogs themselves. As for wildlife, I haven’t ventured there yet. What is your favorite thing about being an artist? What is your least favorite? The best thing is when someone brings one of my pieces home. It means I’ve succeeded in communicating something meaningful for them. That’s what it’s all about. I’m not sure what my least favorite thing would be. Maybe when supply manufacturers change the design, lower the quality or discontinue products I like to use. This has happened a lot with brushes lately. It’s very frustrating. This is a replica of one of Michelangelo’s sculptures from the Medici Tomb. It is one of four allegorical figures marking the passage of time and the cycle of life and death. This little 9″ tall copy is not as massive and muscular as the original, but still maintains the beautiful flow and lines of the figure Michelangelo was so masterful at creating. I love the pose of this figure, and the grace it embodies. I also love that she is the allegorical figure of dawn, and symbolic of a new beginning. I’ve used her before in both drawing and painting. In this study, I chose to add color to the background and used a piece of green pastel paper on the wall behind her. Are their other artists in your family? Is your family supportive? My dad used to paint and draw before he was married. He abandoned it, he told me, because he didn’t think he could support a family doing it. Instead, he found a creative outlet building catboats when he wasn’t at his job as a marine mechanic. Our basement was a place of wonder when he was working on those boats. I learned a lot from watching him. I remember how fascinating it was to see him carefully steam big pieces of mahogany trim and slowly bend them to the form of the hull. He took a lot of pride in his work and built some beautiful boats that are still on the water today. 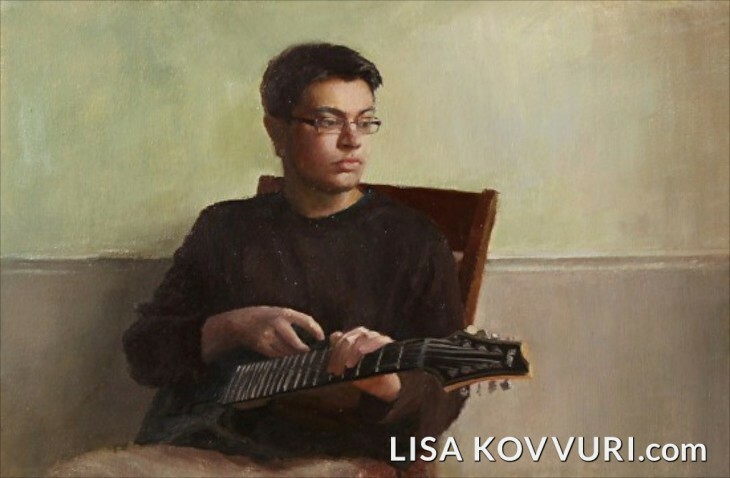 The rest of the artists in my family are musicians. My grandfather played the piano and saxophone, and my sons seem to have inherited that gene. They’re both accomplished guitar players. My eldest is currently pursuing his degree at Berklee College of Music. My family has always been supportive of my work. I’ve been very lucky. Do you feel compelled to paint? Why do you make art? Yes, I do feel compelled to paint. It’s somewhat of an obsession. The promise of that blank canvas just never gets old. I make art because I feel a constant compulsion to explore my surroundings, my world really, with paint. The work is about appreciating things the way they are, embracing the intrinsic beauty in whatever is surrounding me and exploring my connections to it, what it means to me. I think this is something we all try to find our own way to do, consciously or not. What is your most important artist’s tool? Is there something you can’t live without in your studio? Aside from the obvious of paint, canvas and brushes, my favorite tool is a nifty little gadget called a view catcher. It’s a little 31/2” square frame with a sliding insert that allows you to adjust the size and proportion of the window opening to match the size and proportion of your canvas. Looking through it at your subject, you can easily see how it will fit within the boundaries of your canvas. You can use it to decide which size canvas will work best, and to design your composition. I used to do this with an old slide with the film removed, and then used masking tape to frame the right proportion. The sliding version makes it a whole lot easier. What do you enjoy doing when not in your studio? I like to travel and spend time with my family. That often involves visits to my mother’s on Cape Cod or to the lake in the summer, or to my husband’s family home in India. I love to get lost in a good book, visit the MFA in Boston, or spend the day exploring the city on foot. How do you choose the frames for your work? I try to find something that compliments the image and works with the scale, color and feel of it. I’ve recently started working with a new local framer here who has a gordeous selection of moldings. She also has a wonderful eye for what looks good. She’s found some great frames for a lot of my recent work. Do you ever have a problem knowing when a painting is finished? There’s usually a saturation point where whatever I do from that point on won’t add anything significant. It just looks right, and I’m satisfied. Once in a while I have one I’m not sure I’m completely happy with. In that case I may decide to set it aside for a while and distance myself from it, start something else and come back to it later, so I can judge it with fresh eyes. 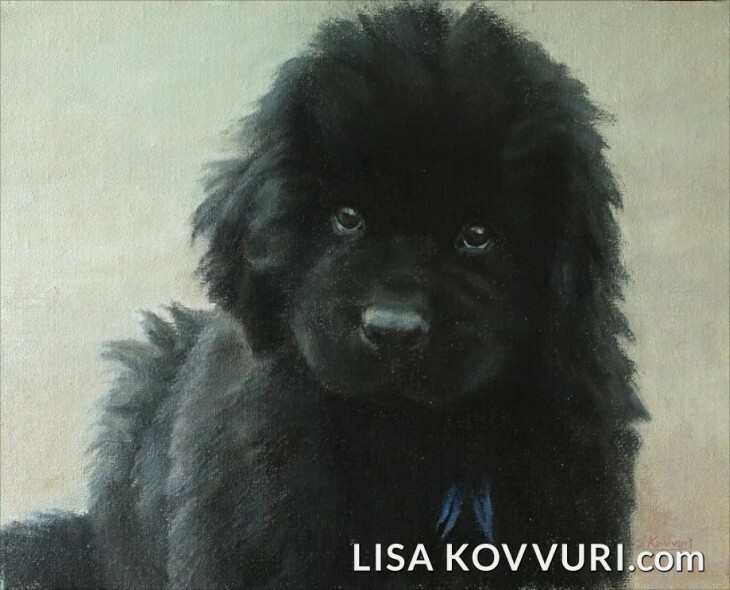 Back in the summer of 2009, Lisa did a project of 100 small paintings in 100 days, and shared it with those who signed up on her web site for a newsletter to follow the project. It was especially interesting to me, because as she explained her thought process for each painting, I came to realize that as a designer there were certain parallels as to how I chose colors, furniture placement, art, etc. for rooms. I also learned a lot by following her project. Below are a few of these art works along with her notations. I’ve had this big white ceramic pot in my studio waiting to be painted for about two years now. 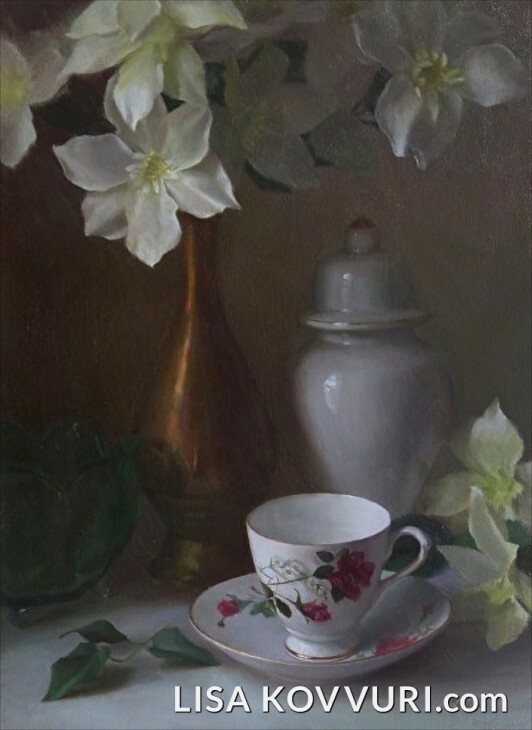 I like painting white surfaces from time to time as it allows me to study the very subtle color and temperature changes within what we perceive to be “white”. I set up this arrangement on a piece of white foam core, and the wall behind is off white and in shadow. It is interesting to see what kinds of colors are reflected in the different white surfaces. It’s fascinating to me that one can make forms turn and recede in space, or even balance a composition, simply by adjusting the color a little. If you look closely at the pot, you can see there is not much variation in light and dark at all, but because I have put yellow and violet next to each other, the pot feels like it’s round. The warm yellow appears to come forward, and the cooler violet seems to recede in space. Consequently, the roundness of form is achieved without having to render with shading or shadows, which would be the traditional solution. Honing my skills and accuracy in reading color this way is one of the things I had hoped to achieve during this project. I’m very pleased with the composition of this piece. It’s not easy to cut a shape (the pot) in half with the edge of the canvas and have it not seem awkward. I’ve succeeded because the emphasis is on the blue design and it’s connection with the holly leaf on the ground. 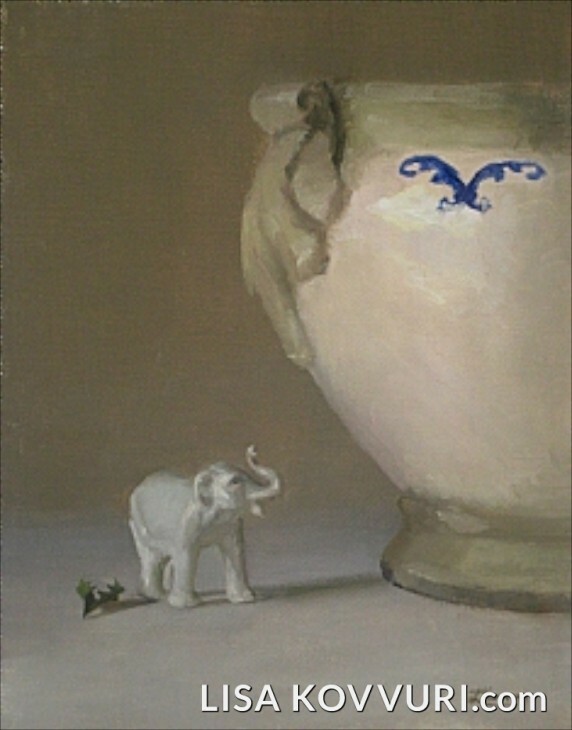 They draw our eyes to the elephant in between, and away from the edge of the canvas. And now for something completely different! This little cat figure is another yard sale treasure I acquired recently. I found her so intriguing I couldn’t resist bringing her home and working her into a painting. I’m guessing she must be a character from a piece of children’s literature that I’ve either forgotten or am not aware of. If anyone reading this recognizes her, I’d love to be filled in on the details. I just love the enigmatic quality and the powerful symbolic potential she embodies. I was interested in the relationship between the ring she is holding and the ring pattern on the Japanese teacup. I decided to elaborate on that idea and added the gold bangle on the ground. 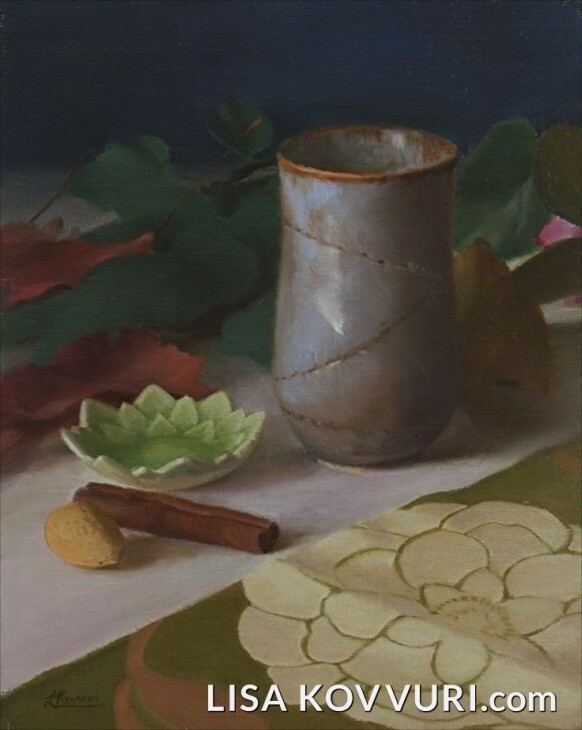 I’ve always liked working with the circle symbolically and have used it in many of my still life paintings. Carl Jung talks about it being a symbol of the self, and an ultimate totality. Depending on what you choose to read into this painting, it can be fun and whimsical, or quite powerful. There are a lot of new things going on in today’s painting. I wanted to try a different kind of design, so I experimented with the background a bit and finally decided on this “T” shaped composition. I haven’t done any glass yet during the challenge, so the bitters bottle was a good candidate to try. The large red central shape of the bottle is balanced by the more complex red patterns in the candies. 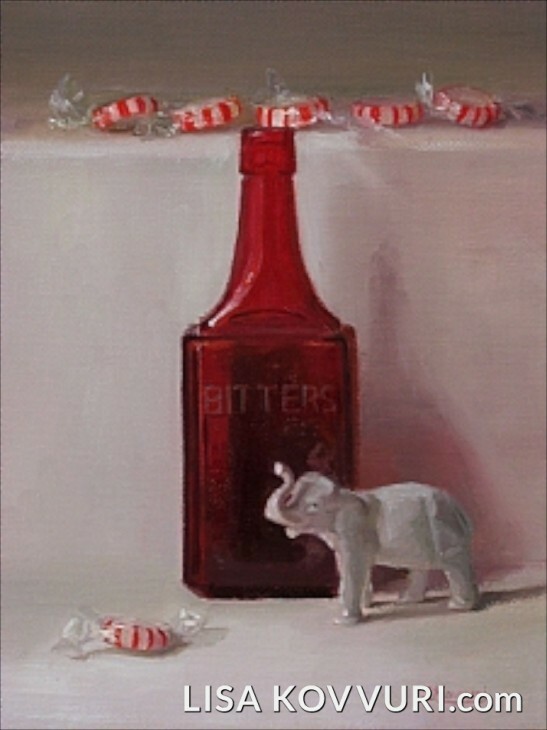 The shadow of the bottle, the elephant, and the piece of candy in the foreground, with their angular positioning, counter balance the more static formality of the lines of the “T” shape. 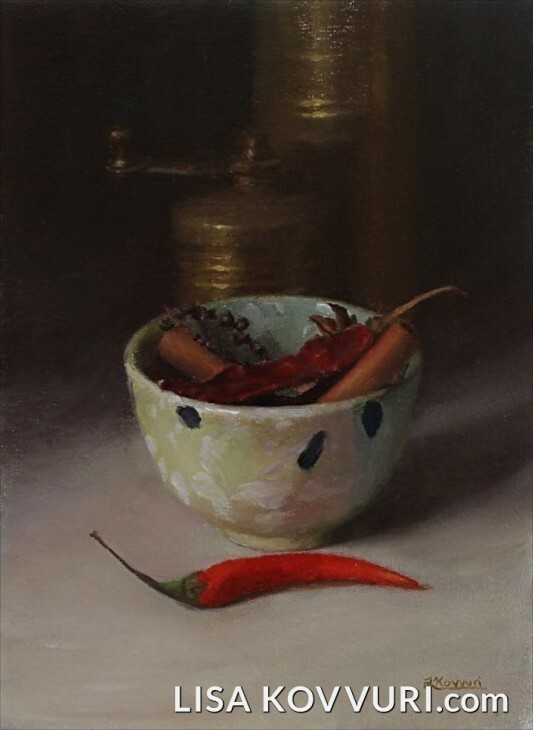 With a word like bitters on the bottle, the painting had to be about flavors somehow. The candies work on both levels. 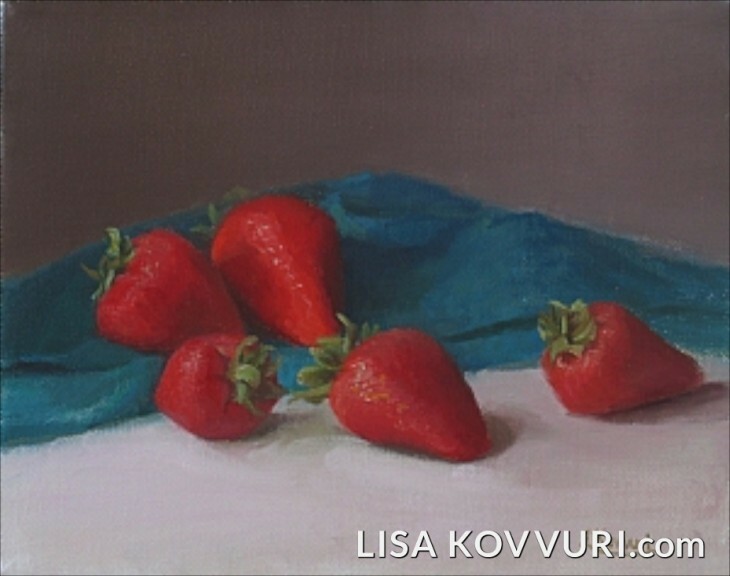 They have a flavor association, and also carry the red color to other areas in the painting. The clear plastic candy wrappers were extremely fun to capture in paint. It was like looking for hints of things floating in the air, since you can’t really see much of it, only how it effects the background through it, and the way the light sits on it in isolated parts. There are two reasons for today’s subject matter. First, I had an urge to do a portrait. Second, and most importantly, because it was raining so heavily throughout the day the light was very low. 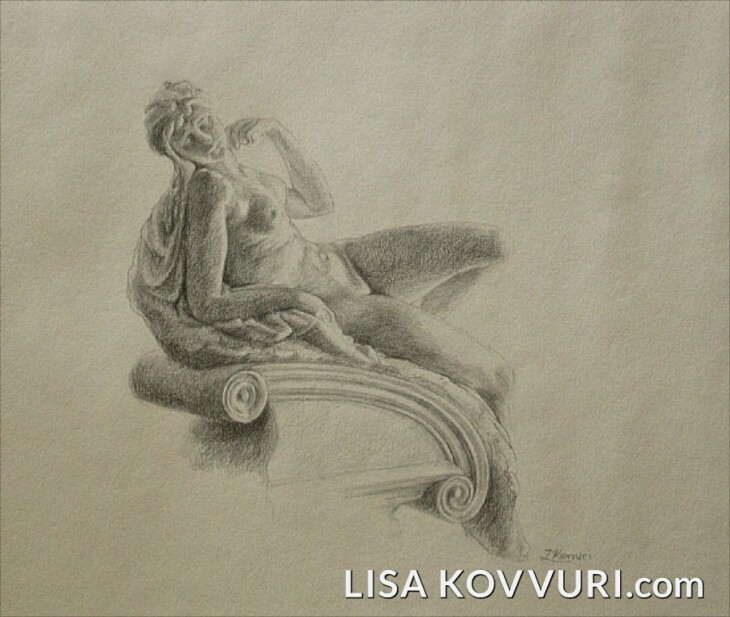 I chose this white sculpture because I thought it would be better to focus on a value study rather than drive myself crazy trying to find color in such poor lighting. This is a replica of a sculpture of Antinous from the Capitoline Museum in Rome. The source I purchased if from claims it is made from a direct cast of the original, which is from the 2nd century AD. Regardless, it is a very beautiful piece of sculpture to have in the studio to study from. A generous neighbor gave me this beautiful red pepper and yellow squash from her garden. I couldn’t eat those vibrant colors without first putting them down in paint! 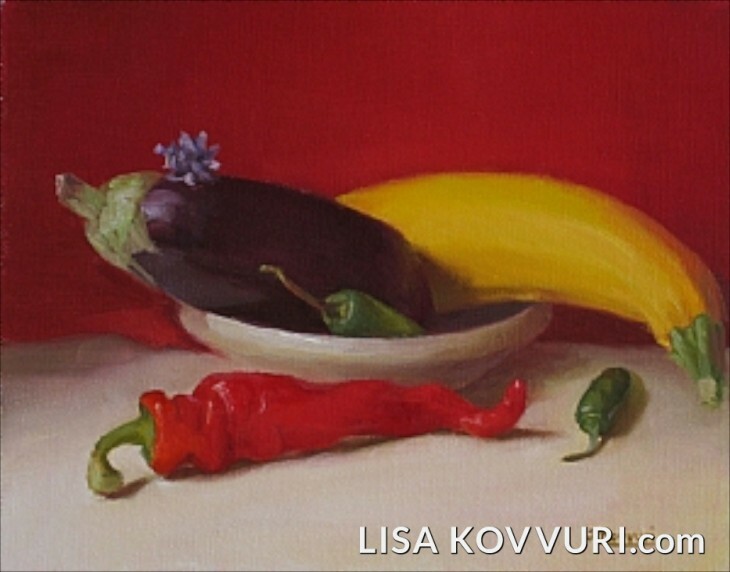 I added the eggplant and jalapenos from my refrigerator and composed another summer painting. I used the red cloth in the background to both unify the color scheme and enhance the vibrancy of the food. There’s something about painting food that always makes me want to make it visually fresh, bright and vibrant. After spending the day studying it, I have a much greater appreciation for the meal it eventually becomes. 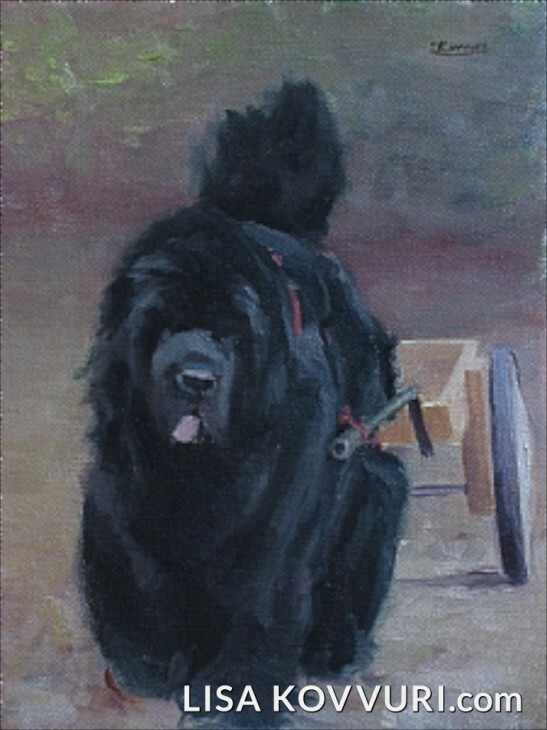 This is one of my favorite Newf images. I have used it before for a head closeup. 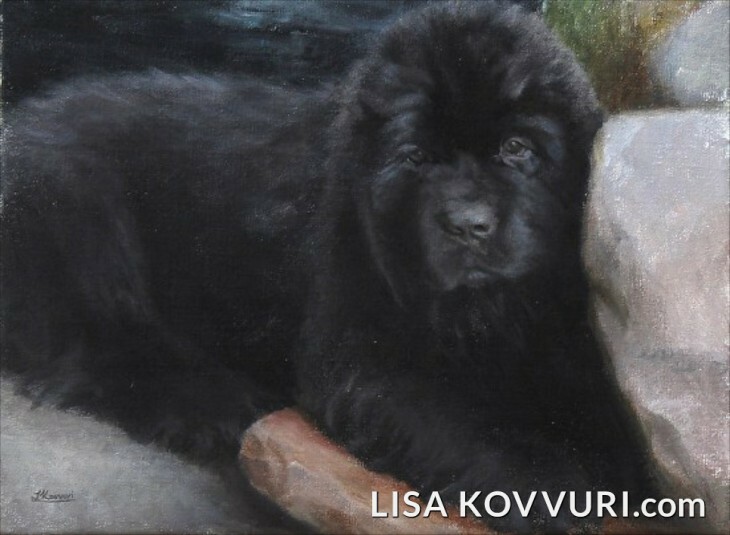 It is one of the dogs in the “Generations” painting some of you may remember from the Newfoundland Club of New England’s maturity class. I have always wanted to do a painting of the entire scene, and this was a good opportunity. I love the composition and the quality of light against the warm tones of the wood porch. It was very interesting to work on the area on the right side of the canvas. The railing is in a cool shadow, the door behind in warm light, and the glass is reflecting yet another quality of light. It was complex and exciting to pull it all together. The strong diagonals in the architecture make an interesting contrast to the shape of the dog, and together with the extreme contrast in light and shadow, give the painting a dramatic quality. This is Alex, a dog who passed away several years ago, just about the time my first son was born. I spent quite a lot of time with Alex and remember him fondly. Not only because of the many walks I took him on, but because he is the only Newf I know of who would respond to the command, “give me a hug”. When asked, he would always oblige and jump up and put his front paws over my shoulders. He was a big sweetheart. This is an appropriate image to signal the countdown of the last 10 paintings I think. This little elephant seems to be leading the charge, as the other objects point in the same direction, ready to march. 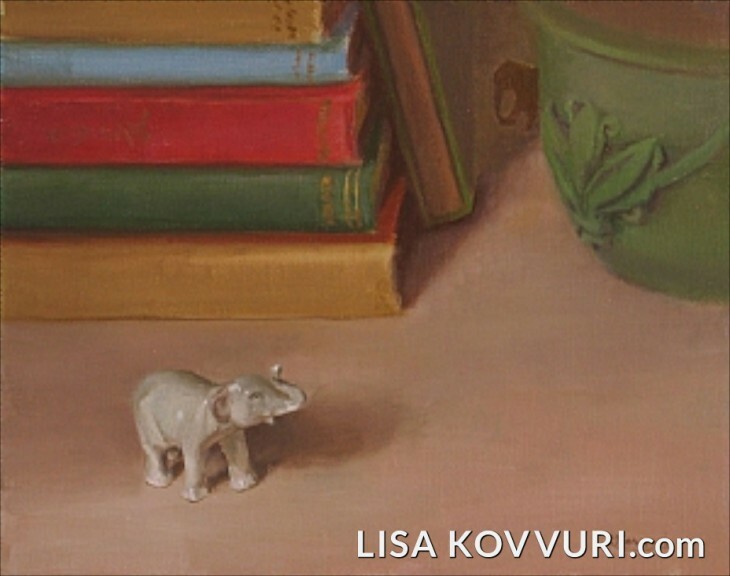 A friend of mine, knowing about my affinity for elephants, placed a substantial collection of them in my care so I might include them in my paintings. This is one of about 20 or so new elephants I have at my disposal for a time to experiment with. The green papier mache box from India functions as the essential element that holds the composition together, keeping our attention and preventing the eye from marching too quickly right out of the picture. 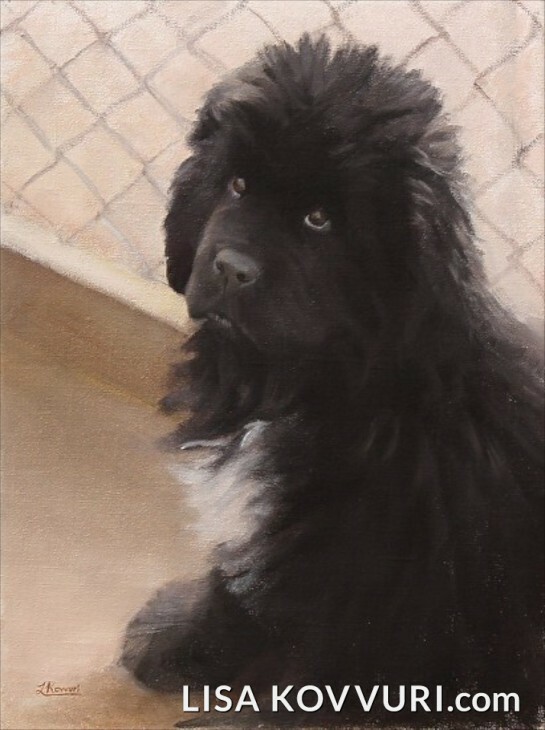 With the last Newf painting of this group I chose to do some more portrait practice. I wanted to continue exploring the techniques I’ve been developing with these, and try and expand my vocabulary of them. 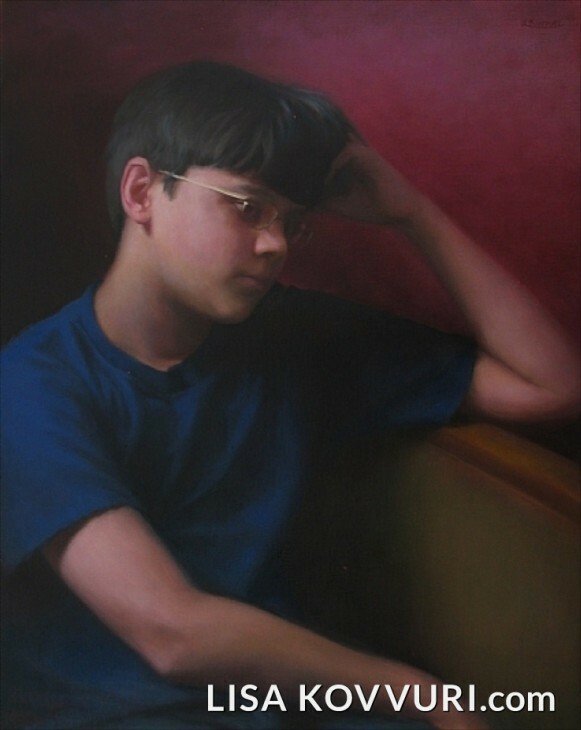 This image worked well as it had wonderful lighting, a good amount of variation in values, and a clear expression. 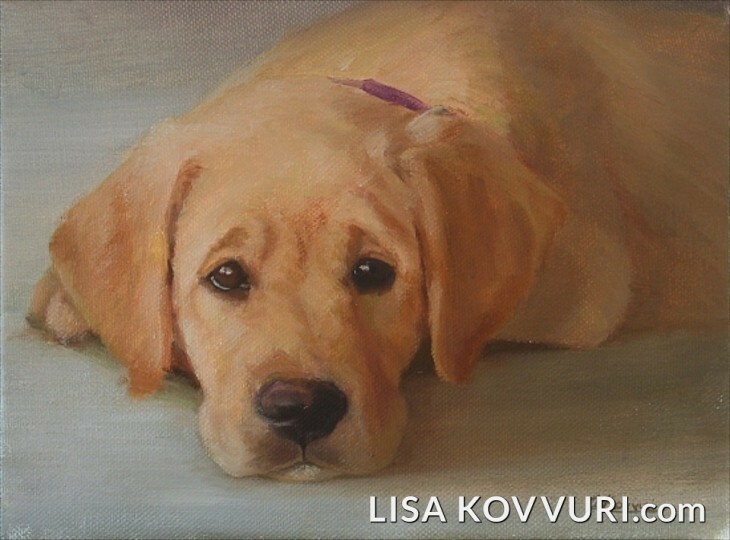 I was really drawn to the soft, all knowing expression of this dog, and like the puppy portrait, the direct engaging gaze that holds your attention and reveals a personality. This image gave me an opportunity to work on a slightly different paint handling technique. 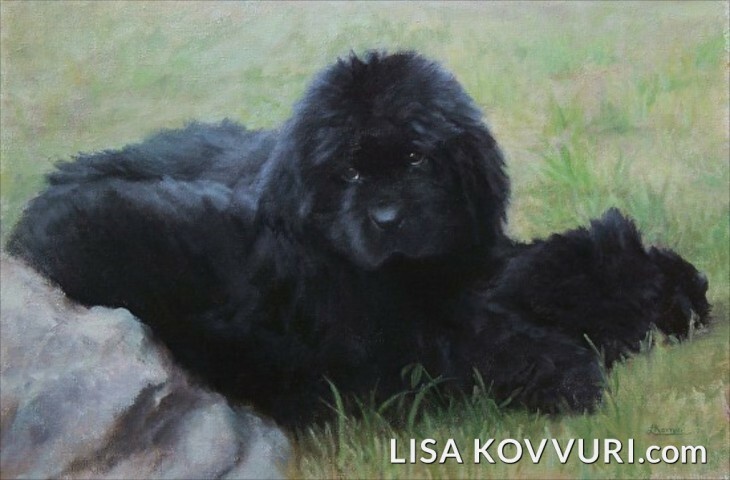 I have been thinking about expanding my paint vocabulary when it comes to depicting the Newfoundlands. Because this image was taken at such a close range and was in a more subdued light, it was an interesting study in texture. The values were very close in range, and the fur had the soft quality of having just been bathed and groomed. There was not the usual variation in the fur that lends itself to the quick, swift brush strokes I’ve grown accustomed to using. It was a very interesting exercise, and a healthy venture into something a little unfamiliar that gave me some new techniques to expand upon. Very rarely do I find good images of Newfoundlands in motion. I was very pleased when this one came along. 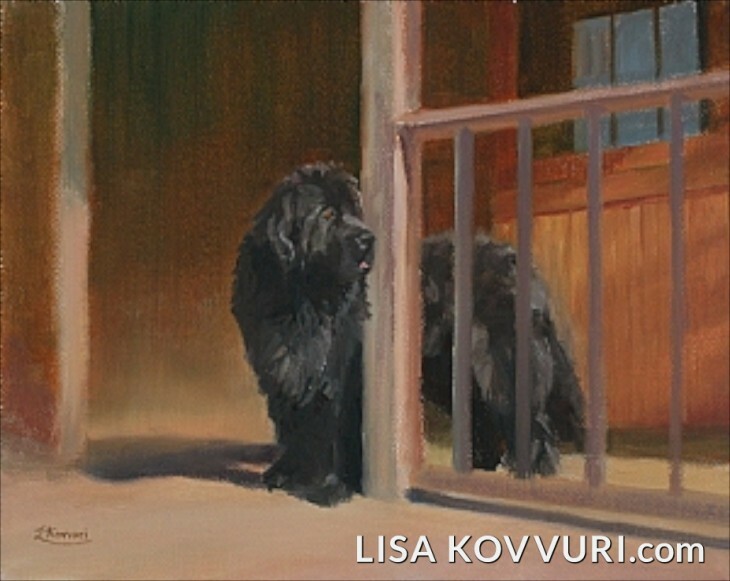 For this painting I wanted to capture the feeling of movement I could imagine the dog having as he is coming toward us. I concentrated very carefully on how I applied the brushstrokes. My goal was to keep them swift and concise so they would contain the same active energy as the dog, and describe how the fur would be moving as a result of his running. The addition of the cart brings balance to the composition. It’s shape and placement add variety and interest to the painting. 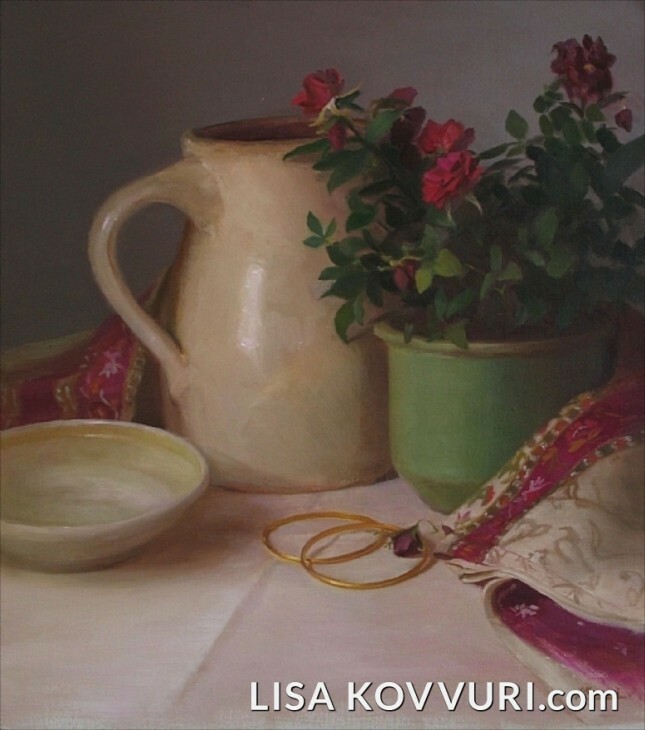 Lisa, thank you so much for taking the time to respond to my questions and for allowing me to share your amazing talent with my readers. 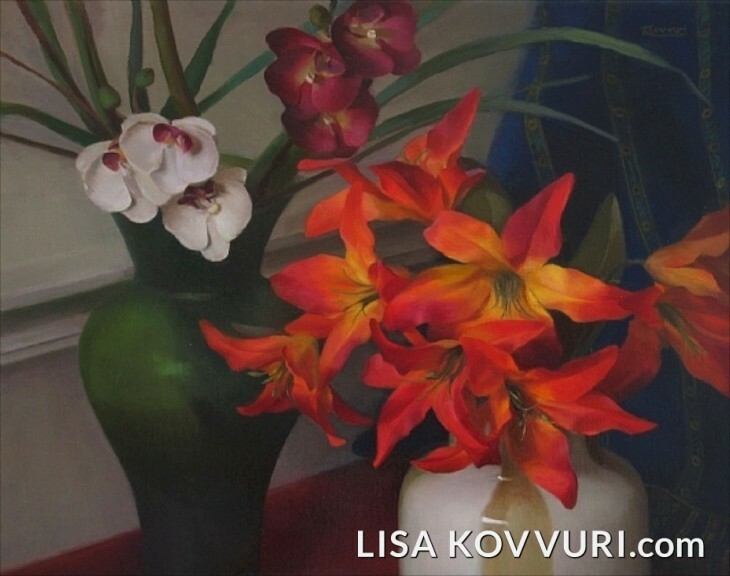 I hope you will visit Lisa’s web site Lisa Kovvuri Fine Art to see more of her work, to purchase original art, or perhaps commission one. All information is on her site. 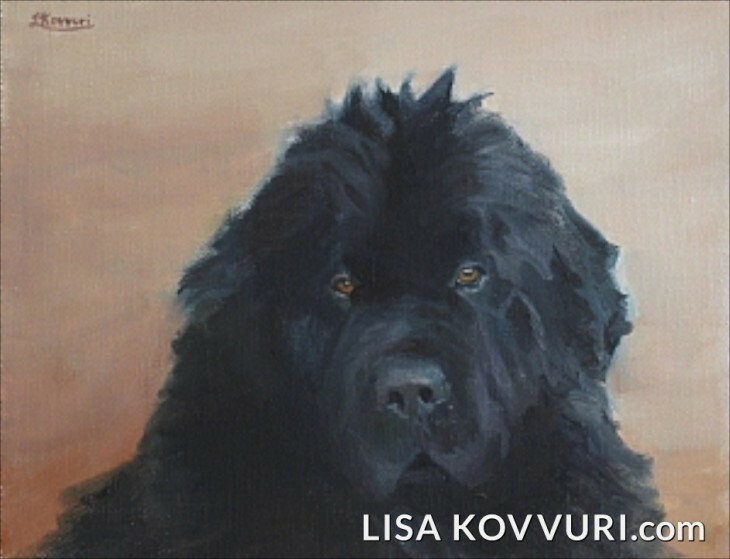 I personally enjoy three of her paintings in my own home, two of Newfoundlands and one a commissioned portrait of my late husband with two of his favorite Newfs done from multiple photographs. I was totally blown away at how she captured his essence, especially because she had never seen nor met him. 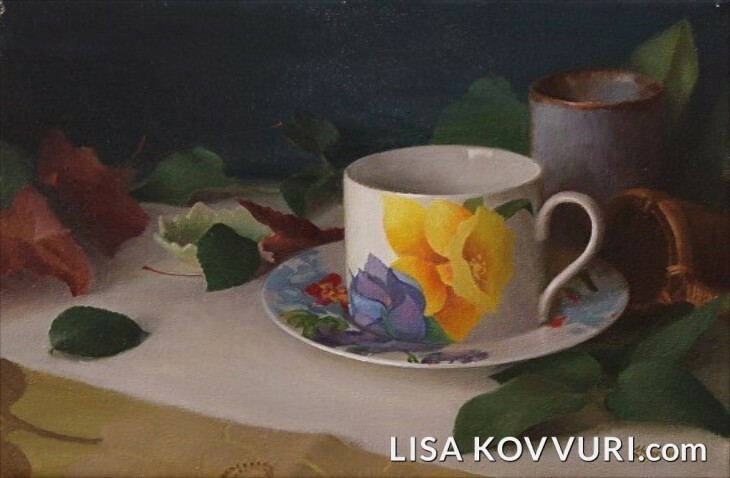 Lisa presently has a new exhibit called Moments To Savor going on right now. 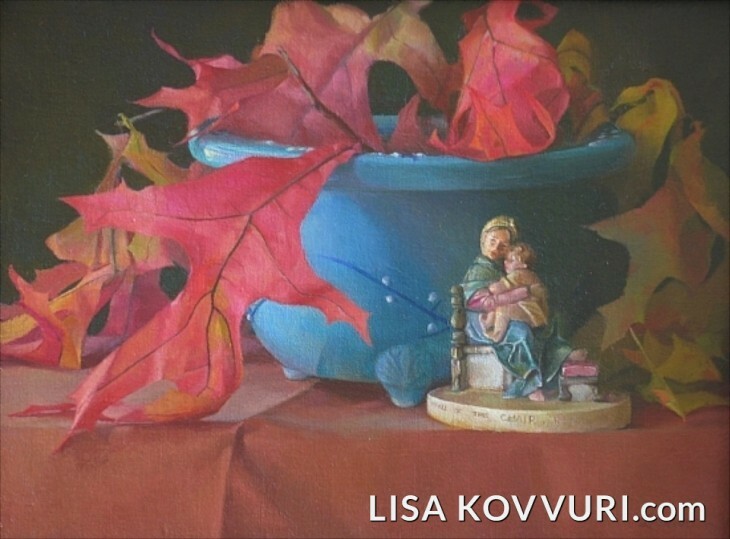 You can sign up for her newsletter where she shares previews of these art works or go directly to her web site to see the first two paintings. A collection of new paintings never before exhibited. Works will be posted on Lisa’s web site, one per day at 4:30pm eastern time, November 7 through 17. subscribe here if you would like to be included in previews. 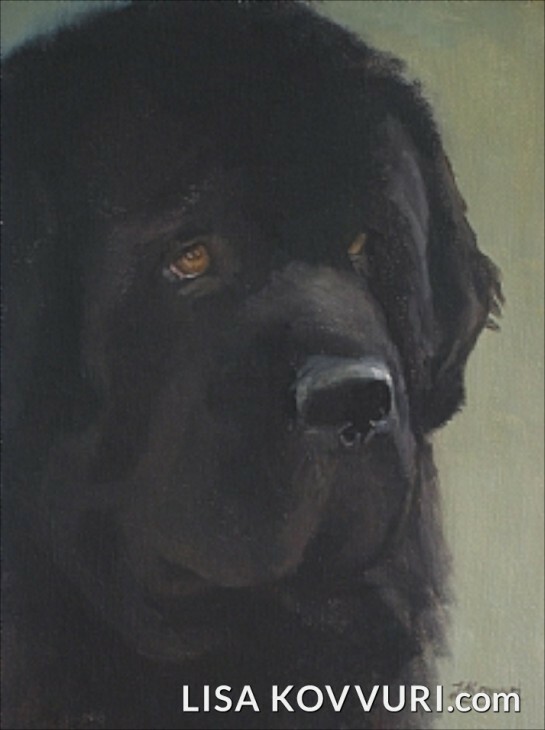 I was just mesmerized by her paintings, and the ones of the newfs brought tears to my eyes because she captured everything that is so special about them. I don’t think any words could capture what she has painted. I didn’t know you had one of Phillip and the newfs. Is there any way you could take a picture of the painting and forward to me via email? I would love to see that. Thanks for sharing. The interview was wonderful. Lisa has a gift, no doubt about it. Expression is so difficult to capture, yet she seems to do it so exquisitely. It made me as admirer for sure. I am sure she will enjoy your comment.